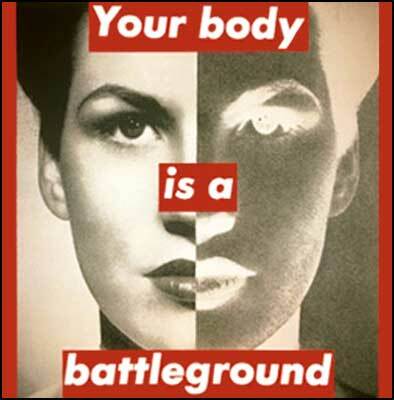 Barbara Kruger is an American artist and designer that is influenced by Russian Constructivism and the designer Rodchenko. Kruger had a career in magazine design at Condé Nast Publications. Where she initially worked at Mademoiselle Magazine and later at House and Garden, Aperture, and other publications (Kruger, 2003). This means that her work is also inspired through those publications and why she used existing sources for her work. 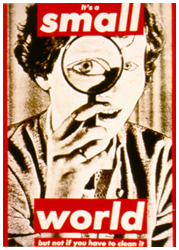 Kruger focuses her work around feminism/sexuality, consumerism, classicism, representation, issues of power and individual desire and autonomy (Kruger, 2003), (Staff Uni, 2011). Kruger layers “photographs from existing sources with pithy and aggressive text” and her work consists of trademark black letters with a red background (Kruger, 2003). According to the University of Michigan Kruger “knows precisely how to capture the viewer’s attention with her bold and witty photomurals”. Plus she is ” one of the most influential artists of the last three decades” (Staff Uni, 2011).